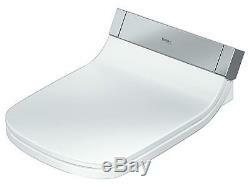 Duravit Sensowash Stack C Bidet Seat, 1/2-Inch, Concealed Connection, White. 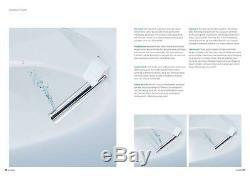 SensoWash Starck C Elongated Bidet Seat with Power Actuated Lid, Surface Controlled Temperature, Remote Control. Toilet wall-mounted washdown model, only in combination with SensoWash, connecting elements for SensoWash with concealed connections included, Durafix included, cUPC listed, 14 5/8" x 24 3/8" Inch. 14 5/8" x 24 3/8" Inch. Toilet close-coupled (without tank), washdown model, only in combination with SensoWash, connecting elements for SensoWash with concealed connections included, hardware included, cUPC listed, 14 5/8" x 27 3/4" Inch. 14 5/8" x 27 3/4" Inch. Toilet close-coupled (without tank), washdown model, only in combination with SensoWash, connecting elements for SensoWash with concealed connections included, hardware included, cUPC listed, 14 3/4" x 28 3/8" Inch. 14 3/4" x 28 3/8" Inch. Toilet wall-mounted washdown model, only in combination with SensoWash, connecting elements for SensoWash with concealed connections included, Durafix included, cUPC listed, 14 1/8" x 24 3/8" Inch. 14 1/8" x 24 3/8" Inch. Two-Piece toilet (without tank), only in combination with SensoWash, syphonic, 12" rough-in, connecting elements for 14 5/8" x 27 1/2" InchSensoWash with concealed connections included, vertical outlet, cUPC listed, 1.28 gpf, 14 5/8" x 27 1/2 Inch. One-Piece toilet only in combination with SensoWash, syphonic, 12" rough-in, with Single Flush piston valve, top flush, connecting elements for SensoWash with concealed 15 3/4" x 28 1/8" Inch connections included, vertical outlet, cUPC listed, 1.28 gpf, 15 3/4" x 28 1/8 Inch. One-Piece toilet only in combination with SensoWash, syphonic, 12" rough-in, with Single Flush mechanism, with side lever, 3" flapper valve, connecting elements for SensoWash with 14 5/8" x 28 1/8" Inch concealed connections included, vertical outlet, cUPC listed, 1.28 gpf, 14 5/8" x 28 1/8" Inch. Two-Piece toilet (without tank), only in combination with SensoWash, elongated, 12" rough-in, vertical outlet, connecting 14 5/8" x 27 3/4" Inchelements for SensoWash with concealed connections included, cUPC listed, 1.28 gpf, 14 5/8" x 27 3/4 Inch. One-Piece toilet only in combination with SensoWash, syphonic, 12 rough-in, with Single Flush piston valve, top flush, vertical outlet, connecting elements for SensoWash with concealed 14 3/4 x 28 1/8 Inch connections included, cUPC listed, 1.28 gpf, 14 3/4 x 28 1/8 Inch. One-Piece toilet Duravit Rimless® rimless, connecting elements for SensoWash with concealed connections included, syphonic, 12" rough-in, only in combination with SensoWash, 14 1/8" x 28 3/4" Inch with dual flush piston valve, top flush, vertical outlet, cUPC listed, 1.32/0.92 gpf, 14 1/8" x 28 3/4 Inch. Listing and template services provided by inkFrog. The item "Duravit Sensowash Stack C Bidet Seat, 1/2-Inch, Concealed Connection, White" is in sale since Wednesday, August 15, 2018. This item is in the category "Home & Garden\Home Improvement\Plumbing & Fixtures\Bidets & Toilet Attachments". 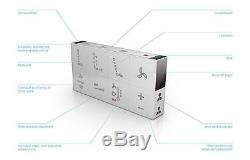 The seller is "discountpros2013" and is located in Anaheim, California. This item can be shipped to United States, Canada, United Kingdom, Denmark, Romania, Slovakia, Bulgaria, Czech republic, Finland, Hungary, Latvia, Lithuania, Malta, Estonia, Australia, Greece, Portugal, Cyprus, Slovenia, Japan, China, Sweden, South Korea, Indonesia, Taiwan, South africa, Thailand, Belgium, France, Hong Kong, Ireland, Netherlands, Poland, Spain, Italy, Germany, Austria, Israel, Mexico, New Zealand, Singapore, Switzerland, Norway, Saudi arabia, Ukraine, United arab emirates, Qatar, Kuwait, Bahrain, Croatia, Malaysia, Brazil, Chile, Colombia, Costa rica, Panama, Trinidad and tobago, Guatemala, Honduras, Jamaica.